We’ve teamed up with Quintin (who else makes hats as good as these guys?) to hold a winter contest and give away our last 1 year anniversary hat. 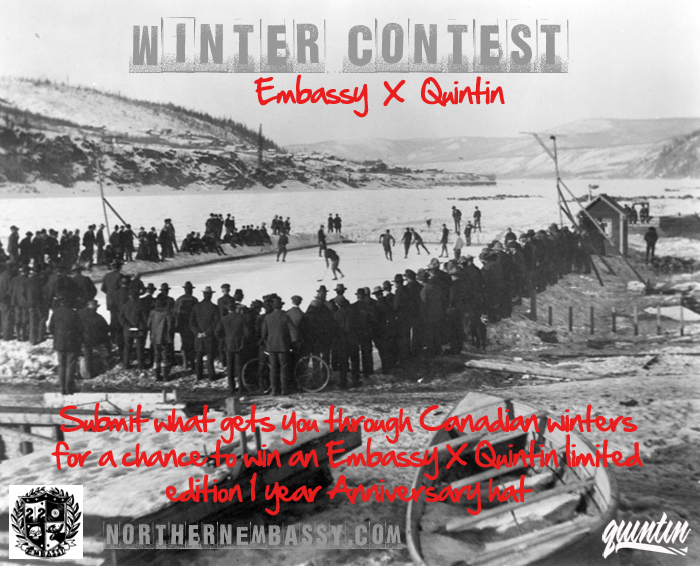 The contest is simple, you have until March 1st to submit what you do to get through the Canadian winter. It can be anything: pond hockey, snowboarding, indoor riding, goin hard in the Mac, getting stizzed, whatever. You can submit it by photo, edit, writeup, whatever you can think of. Be creative! All entries should be emailed to northernembassy@gmail.com. The winner will be chosen by the Embassy crew and announced shortly after the March 1st deadline. We will be posting up some of our favourite submissions throughout the contest. Have fun with this and share it with your friends on Facebook. ps. If you are still looking to buy one of these hats hit up BMX Gallery or 3Ride to grab one. They may still have a couple left.